Our windows and doors are guaranteed for 10 years. This is backed up by an insurance backed warranty which will be issued once we register your installation with FENSA. Too many installers go out of business each year, only to reopen again under a new name, rendering all guarantees useless. Ask for the company registration number as proof, and check them out with Companies House. At Windseal Double Glazing we are proud to have been in business for over 25 years. Over those years we have carried out many repairs for people who didn’t buy from us, and the company they did buy from had either a) gone out of business leaving them without a guarantee, b) plainly refused to do anything about the problem or c) -and some of the big companies do this- try to charge them for the repairs. We have replaced two year old glass units, 18 month old door locks, and even complete five year old windows for people who for whatever reason were unable to get them fixed under their guarantee! We have even taken down conservatories because the footings did not even go below grass level! Does your window rating have the correct certification? If someone is selling you an A, B or C Rated window they will have a BFRC or Certas certificate with their company name, and registration number on. If they do not have this then their window HAS NOT BEEN RATED! ”Rated” means that the window has been tested, awarded a certificate and reg. number, and is independently checked every year to make sure it is being manufactured to the correct standard. This is the only way you can be sure that you are actually getting what you have ordered. Our A+2 rated window is independently checked every year by Buildcheck. It has never been more important to make responsible choices when buying any product. If there is an environmentally friendly product available, such as an A+2 Rated Window, this should become one of you priorities. Always ask to see the rating certificate. 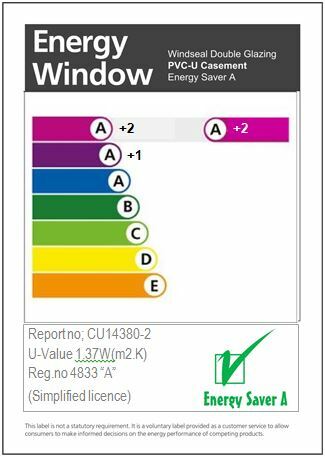 An A+2 Rated window will not only help reduce your carbon footprint, but will also save you considerable amounts of money on your future fuel bills. Are your windows and doors CE Marked? By law all windows and doors manufactured in the UK now have to be CE marked for safety and quality assurance. The frames should either carry a CE mark and number, or be supplied with a paper certificate for you to keep in your records. Windseal Double Glazing supply a paper CE Certificate with all of their windows and doors. Are you Fensa or Certas Registered? Fensa registration is essential when having new windows installed, as it proves compliance with Document L and building control. Many salesmen may claim to be Fensa registered, but ask for their registration number as proof. Certas is an alternative acceptable company to Fensa. Windseal Double Glazing are Fensa Certified. 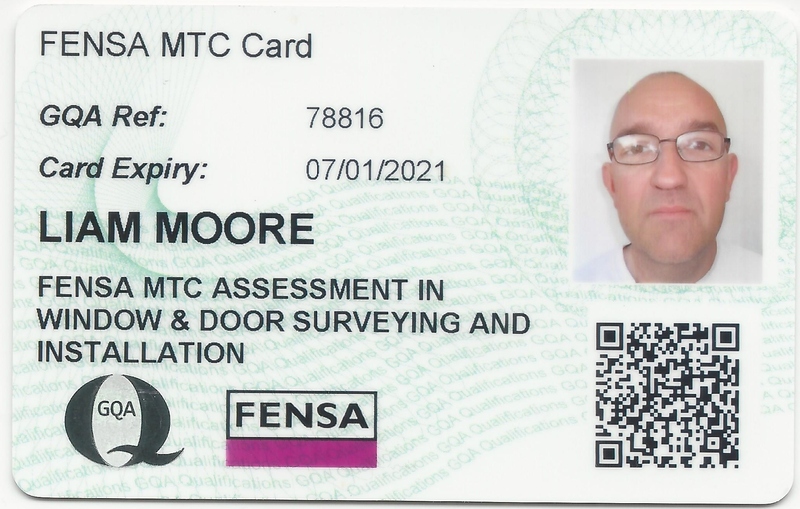 Are your fitters MTC qualified? Yes, our team is lead by a fully MTC qualified fitter with a 98% pass rate (the highest FENSA had ever seen at the time of passing!) read more about MTC Competency. Can we visit the factory where the windows are manufactured? At Windseal Double Glazing we manufacture all our own windows, and you are very welcome to visit during working hours. Not all double glazing companies manufacture their own windows and doors. Many buy them in at the lowest price possible from a “Super Fabricator” hundreds of miles away. These companies churn out mass produced cheap quality windows, and when something goes wrong they are HUNDREDS OF MILES AWAY! If there was a problem in the future you might have to deal with a third party, who don’t even know who you are. That is if they are still in business! Check that the company you deal with actually manufactures windows and doors, and ask to visit their factory. Don’t forget, anybody can rent a fancy showroom; this is not proof of their manufacturing abilities. Keep local jobs by supporting local manufacturing companies! Likewise, if the “company” you are buying from, buys his windows in and works from the back of a van, how do you know that you will be able to get in touch with him in 6 years’ time if there is a problem? Is he even a registered company? Does he even live in the area? Travellers are well known for blitzing an area for work, and then moving on never to be seen again. If you have been quoted a “too good to be true” bargain of a price, which undercuts all other quotes then be wary! We have seen so many people fall for this and yes although they DID save money, they DIDN’T actually get what they had wanted. They ended up with basic cheap windows passed off as A Rated quality. To cut the price you have to cut corners! If it seems too good to be true it probably is… THINK ABOUT IT! *Plaster work in a bad state of repair is not our responsibilty.